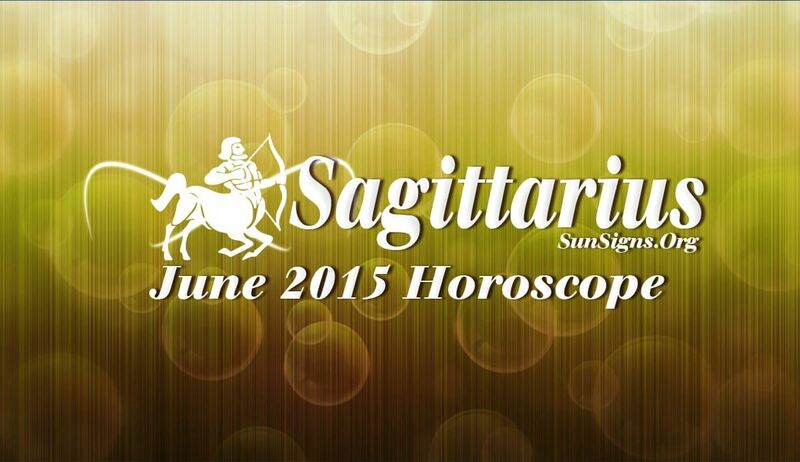 Sagittarius June 2015 Horoscope forecasts that you will pay major attention to business and career this month. Family and spiritual issues should also be kept in mind, but they will be less important. Emotional disturbances will affect your family environment till the third week and will blow over after that. You will work hard to make your home a delightful place to live, with beautification and addition of luxuries. The social grace and charm of Sagittarians will succeed over self-will and independence in June 2015. The career prospects for the Sagittarians will see good growth, but the pace may not be to your liking. Any change in job should be properly examined. You have to be careful while communicating with your business associates and superiors. The June 2015 Sagittarius monthly predictions foretell that earnings will be generous. You will have enough money to pay off old loans and cover your expenditure. You can indulge in risky ventures which will yield good returns. Your focus should be on helping others with your hard earned money. Planets are helpful in matters of love for the Archers. The month of June 2015 is fabulous for falling in love and social activities. Singles will need to keep a few things in mind if they start dating this month. This is a good month for getting pregnant or beautifying your bedrooms, especially those of children. The 2015 June Sagittarius horoscope predicts that health is delicate during the month and requires major precautions to stay fit. Take sufficient breaks and relax. Do not get depressed over minor issues. Avoid unwanted confrontations with others and try to keep stress away.